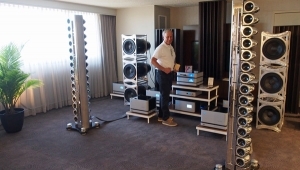 My beat at the 13th RMAF was the 7th and 11th floors of the Marriott Tower, so to kick off my reporting, my first room on the 7th floor was Dynaudio USA. 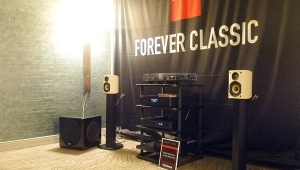 Featured in the system was Dynaudio's new two-way Contour 20 loudspeakers ($5000/pair). 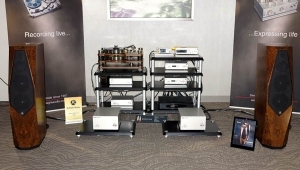 Mounted on Stand 6 stands ($500/pair), the Contour 20s were driven by an Aurender N100 server ($2499) feeding a dCS Debussy DAC ($11,999) and the new Octave V110 SE integrated amplifier ($8000) via Cardas Clear Beyond interconnects and Cardas Clear speaker cables. 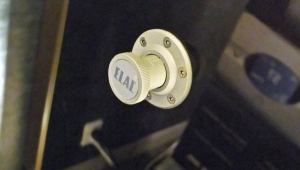 On passive display was the Model 30 tower ($7500/pair) and both of the new models feature drive-units developed with use of finite-element analysis (FEA). 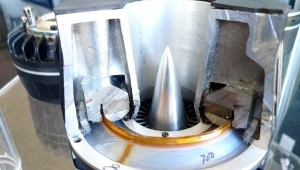 The woofer and midrange driver use a diaphragm, the thickness of which varies across the profile to give improved mechanical stability and radiation pattern, and the baffles are solid aluminum. 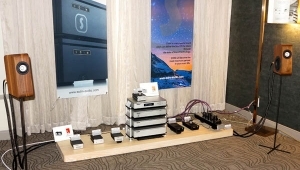 The Octave V110 SE integrated amplifier was being demmed with the auxiliary Super Black Box power supply upgrade module ($3000) and a phono module is available for an additional $500. The amplifier offers 110Wpc from push-pull pairs of KT120 tubes and in a first for the German company, offers three levels of damping factor. As I entered this room, Bob Dylan's "Girl From the North Country" was playing, with a palpable vocal presentation, but it was when Dynaudio's Mike Manousselis played James Blake's "Limit to Your Love," with its potentially woofer-busting levels of low frequencies, that I was able to hear just how clean, extended, and well-defined this new two-way speaker's bass was. Round the corner from the Dynaudio room was English pro-audio company PrismSound, who were premiering the new Callia D/A converter ($2745). The Callia has both S/PDIF and USB inputs and handles PCM data with sample rates from 44.1kHz to 384kHz and DSD data via DoP up to DSD128. 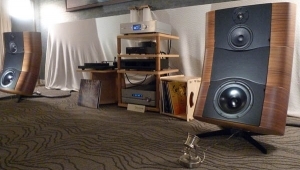 With a volume control, and both headphone and regular outputs, the Callia was being demmed in a system featuring ATC SCM40A active speakers, a Cyrus CD transport, and Atlas interconnects. I was impressed by how this system reproduced with consistent fatigue-free clarity Eric Clapton's new album, which was recorded in Mark Knopfler's studio with PrismSound converters, a 24/192 recording of Saint-Saën's "Organ" Symphony, and a recording of Beethoven's Symphony 5 with the Pittsburgh Symphony. 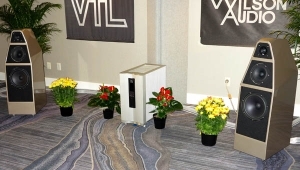 Last year, Bel Canto's Black D/A amplification system was our 2015 Amplification Component of the Year, so I was intrigued to see similar cutting-edge digital technologya 64-bit A3P processor, a DSP-implemented tilt control, and a 40 femtosecond master clock) and Hypex NCore class-D power-amplifier modulesfeatured in the Minnesota company's new Black ACI 600 integrated amplifier ($25,000). 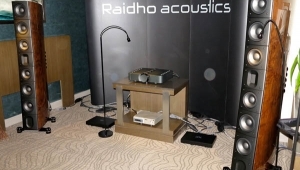 Featrung a programmable MM/MC phono stage and offering 300Wpc into 8 ohms from a small elegant package, the ACI 600 was being demmed with Verity Audio's Parsifal Anniversary speakers ($24,995/pair) with WyWires speaker cables and USB cable and Shunyata Hydra Triton V2 power distribution ($6998). 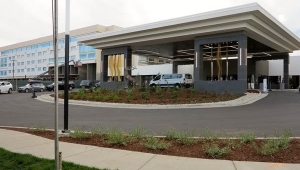 Complementing the Marriott for their efficient Ethernet wiring, Bel Canto's Mike McCormick explained that there will be an app to control the amplifier and that it is Roon-ready and will control Tidal streaming. I asked about MQA and was told that Bel Canto's John Stronczer has been working with MQA's engineers but is not yet ready to make an announcement. 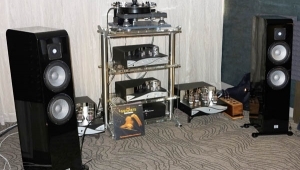 High-tech digital technology was also to be found in the Bricasti room, where the new M12 Dual Mono Source Controller, a D/A preamplifier ($15,995), was being demmed with the new M15 stereo amplifier ($18,000), Tidal speakers from Germany, and ZenSati cabling. Both Jon Marks and I had been impressed by Bricasti's M1 DAC when we reviewed it for Stereophile. The M12 is based on the M1's technology but with two developments, the first being using a resistor-ladder volume control and the simplest-possible DSD conversion where the one-bit datastream is fed to flip-flop chips followed a simple analog low-pass filter. This should give superb time-domain performance, but the downside is that if the datastream is paused or stopped, you could get a full-scale bang from the DAC's output. Bricasti's Brian Zolner has arranged that if you pause or stop DSD playback, the M12's volume control quickly fades down, fading back up when playback is started or restarted. 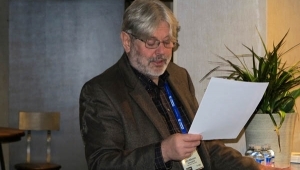 The effectiveness of this approach to DSD decoding was demonstrated using a DSD64 recording of Mahler's Symphony 9 from Channel Classics played via Ethernet from JRiver. The pure DSD playback had a superb sense of space around the orchestra whereas converting to hi-rez PCM on the fly flattened the soundstage, taking away some of the magic. "That's a familiar setting," I thought when I went into the Sanders Sound Systems room and saw the pastoral backdrop behind the Model 10E speakers. 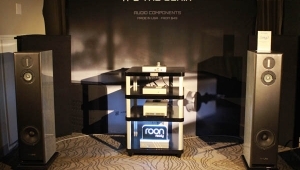 Costing $17,000/pair with a DSP-implemented crossover and a Magtech amplifier, the 10E combines a flat electrostatic panel with a powered woofer. 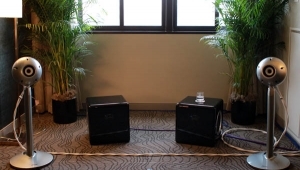 DSP room equalization is possible with the crossover, but Sanders had also worked with the room by setting up the speakers to fire slightly toward the room's diagonal rather than the length. It was astonishing how the image of Willie Nelson's voice snapped sharply into focus as I sat down in the sweet spot. 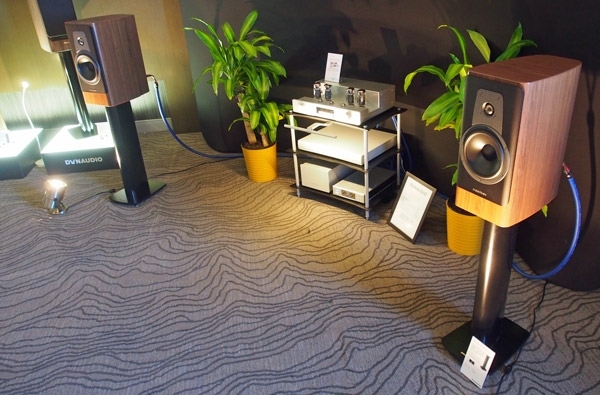 The visually imposing speakers in the Source Systems room, the French Philharmonias by Amadeus ($40,000/pair), were new to me. Designed by Jean Nouvel, the lead engineer for the Philharmonie de Paris, the fully active Philharmonia uses custom drivers, a proprietary 64-bit DSP, and four 700W amplifiers, and was being demmed with the Lumin U1 digital audio streamer/renderer, feeding an AES/EBU datastream via an Esprit cable to the left speaker, which in turn fed it to the right speaker. The sound of Gershwin's "American in Paris"my apologies for not noting the performer or labelwas both inviting in the mids and full-range. Final stop for this first report was a room featuring a name new to me, Band-Width Audio. 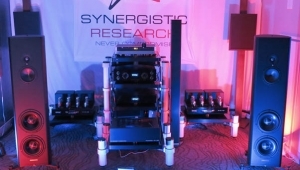 This Dallas-based amplifier manufacturer was showing two models: the 60W 288 monoblock ($6500/pair), which uses a push-pull pair of KT88s; and the 5W 22A3 monoblock, which uses a pair of 2A3 tubes running in parallel single-ended mode. 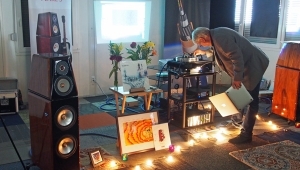 I auditioned a live Joe Bonamassa LPthere was a lot of Joe Bonamassa being played at this showplayed on a VPI Scout turntable with a prototype Cascade phono preamplifier and with Tannoy Turnberry speakers driven by the 60W amplifiers. The sound was impressively clear and uncolored, though I had to crouch to get my ears level with the Dual-Concentric drivers' tweeters. This is a common problem with shows, where the usual chairs place the listeners' ears too high. But Band-Width is definitely a name to look out for. Guess I will be the first to comment on this. I first came across the word "demmed" in this article and casually thought it was a typographical error for demoed, which would seem the more appropriate word in the context it was being used. So I am wondering, is this neologism of demmed for the sake of being hip, cute, cool or something else? I can see it is being used in place of demoed but can't understand why. We typically don't say "Can you dem this for me please but rather, can you demo this for me please?" so the logical word does in fact seem to be demoed (an existing and understood word) if a past tense of the verb is required. Maybe I don't get out enough and demmed makes perfect sense to others. Anyhow, my tiny rant over unnecessary neologism is over. I do enjoy reading many Stereophile articles FWIW!